This is a review of a Mini PC which I got some time ago. I've had it a few months now so it's had a good run through for this review. The same model is still available to buy, although I'm guessing comes with a newer version of Ubuntu. Plus a few other things like a proxy server to access UK only websites whilst travelling etc. The main features I was looking for is low power (as it is always-on then power cost is significant) and low noise, both of which are outstanding. It also had to run Linux, but having Ubuntu pre-installed was a bonus. Tiny PC - What's included? The PC is small. I lie it on it's side and it takes up about the same space as my Amazon Kindle ebook reader, but quite a bit deeper. Looking at it another way it's about the same size as a home ADSL router / modem. It can lay flat, stand up vertically or even be mounted out-of-sight at the rear of a monitor. I originally ordered a black Nanosaur 330 as shown on the DinoPC website, but I was contacted by the supplier asking if white would be acceptable instead as the black ones were on back order. The colour wasn't an issue so I got the white model, although the black model may be better if you were looking for something to use in as a home media centre (it has HDMI built-in so would be suitable for use with a HD-TV). As well as the HDMI output there is a DVI digital video port, but no analogue VGA port (which is what most monitors still use), but it does include a DVI to VGA adapter, although it does stick out some way from the back of the computer. There are 4 USB ports and an SD slot. There is built in wireless networking 802.11n as well as an ethernet port for wired networks. I found the wireless to be unreliable in my house, but I believe that to be partly due to interference. I get similar problems with my netbook, but my Dell laptop works better (although my laptop still has speed issues rather than drop-outs that the miniPC and netbook suffer). 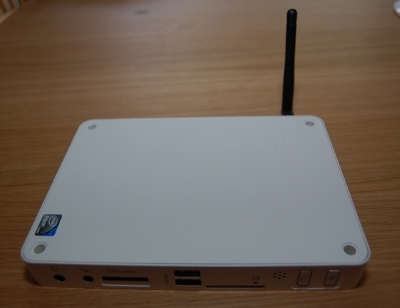 The miniPC has the same Atom processor as used in Netbooks (eg. Asus EeePC netbook), so it is not a particularly fast processor. It can handle everything I do quite easily although I run Xfce rather than Unity (see later). It runs web based games quite well, and can even handle photo editing, but would not be able to run any processor intensive games or video editing etc. As far as power usage is concerned the DinoPC is very low powered. I estimate that compared with the PC I was running before it will pay for itself within 2 years or so in electricity savings. It is also very quiet. After my noisy PC I thought that the computer was turned off at first, is really is that quiet. Much of the time there is no active cooling, but there is an internal fan which comes on sometimes. It is noticeable, but not too loud to be a distraction (a little quieter than most laptop fans). It includes a built-in speaker, but also has speaker / microphone jacks to improve on the sound quality. 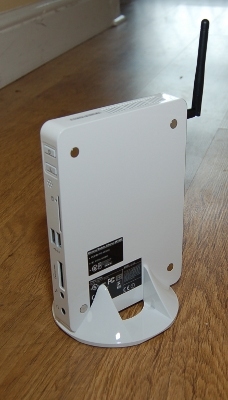 The Mini PC comes with Linux pre-installed. It uses a standard Ubuntu Linux. Mine originally arrived about a week after Ubuntu 11.04 was released and was installed with the very latest version which was impressive. It was a standard install, but they had made the effort of using my own name as the default login which it went into straight away. The only problem was that they didn't tell me the password. I expect that if I'd emailed them then they would have provided it, but it was a weekend and so I just reinstalled Ubuntu Linux. Ubuntu Linux is an easy to use operating system which is free* and comes with lots of free software. This includes just about everything you would want to do including office suite, web browsers, photo editors and video editors, so you don't normally need to buy any more software. It doesn't however run Windows software (although there's usually an alternative), but some can be used by using WINE or paying for Crossover WINE software. The only thing I found was that Ubuntu is a little slow on such a low powered machine. It is usable, but not as responsive as I would like. I therefore installed xubuntu which has all of the same software as Ubuntu, but uses less memory and runs faster. *Free can mean that you don't need to pay to use it, but for open source software it also means you have the freedom to use and modify the programs as you wish. It does includes some proprietary drivers, but most of Ubuntu Linux is completely FREE in both respects. The DinoPC is small, low power and very quiet. It can handle most computing functions, but is based on a low power processor so is not up to particularly intensive programs. It comes pre-installed with Ubuntu Linux which is easy to use and saves a lot on having to buy Windows and additional software. You just may need to ask what the password is as they forgot to include it when they sent mine. To make it run faster you may also want to consider replacing Ubuntu Linux with Xubuntu Linux which is free and runs a bit faster. Embedded Linux - Are you already a Linux user?